I hung a sign in my son’s room that says: “Go outside and play.” I laughed when I saw the sign at Morgan Imports in downtown Durham and knew I had to have it because I say that exact thing at least five times a day to my children. My kids, ages 2 and 7, are actually pretty outdoorsy. 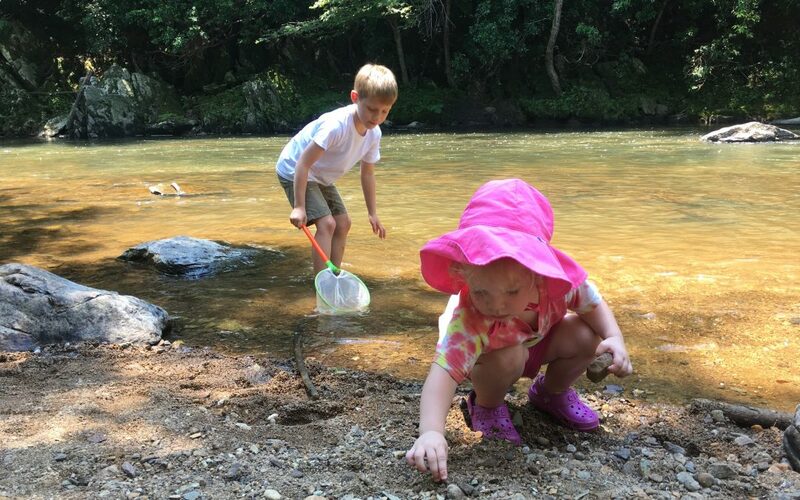 We frequent the Eno River on the weekends, and our general parenting philosophy is, the dirtier they get outside, the more they learn and the more fun they have. We have chickens and a garden in our backyard, plus the occasional pet frog or lizard, a garden hose, a bubble machine, a swing set, and a million other simple things to do and look at outside. But, like most kids, my children also love their air conditioning and screen time. My son is playing a lot of Plants vs. Zombies these days (don’t judge me), and my daughter has developed a love for animated musicals and already knows her way around Netflix. Such are the dilemmas of modern parenting. A little bit of screen time is okay, but getting kids (and adults) outside is important for their health and well-being, as many studies have shown. One person who knows how important it is to get kids out into nature is Wendy Tonker, the executive director of Schoolhouse of Wonder, an award-winning nonprofit in its 28th year. Schoolhouse provides outdoor day camps, outdoor field trips, and leadership training with locations throughout the Triangle. Wendy came upon Schoolhouse of Wonder 10 years ago, when looking for a “place without plugs” for her oldest child. She remembers dropping him off on a brisk January day and seeing his “Where in the world did you just drop me off, Mom?” face in the rearview mirror as she drove away. When she picked him up that day and saw how much fun he’d had without an iPad, and how much the counselors cared about connecting with him, she knew she’d found a gem. She’s served as the director for the past six years and works closely with her team to make sure the camp adheres closely to its mission of creating “kind, curious, and confident” kids. “There are also so many health benefits to being outside,” she says, “everything from the calming effects of nature, to the exercise from hiking and running around, and even a little Vitamin D from sunshine.” I know that my son came home every day that week exhausted but in the best way. Okay, so now that you’re convinced to get those kids into the great outdoors this summer, how do you keep them safe? Wendy and her staff at Schoolhouse of Wonder care for more than 5,000 kids who come through their outdoor camp and field trip “doors” every year. I asked her about the main outdoor ailments that arise each year and the best ways to avoid these common summertime concerns. I also checked with one of our medical directors, Dr. Joe Oleniacz, a pediatrician who was in practice for more than 33 years before coming to Blue Cross and Blue Shield of North Carolina, and who has seen it all. We all know that when the weather is really hot, as it gets in North Carolina in the summers, increasing fluid intake is essential. Wendy says that each camper carries a bottle of water (16 ounces or larger) every day. And since you can become dehydrated before you even feel thirsty, counselors use a variety of techniques to get kids to refill – like friendly competitions (first one to the water station, go! ), songs, funny faces, and games. They encourage camp parents to send snacks high in water content (think watermelon), and they schedule activities around the heat (running activities in the morning; water time at mid-day; and late afternoons spent in the shade of the forest). Their staff is trained to look for warning signs of heat-related illness. Dr. Oleniacz agrees with the camp’s techniques and notes that sports drinks aren’t really necessary for regular outside play (Wendy agrees). He also cautions not to let kids drink out of a water hose (like we all did when we were kids) because they may contain lead and other toxins. The Schoolhouse staff ask parents to apply sunscreen to their kids at the beginning of each day, and they assist campers in reapplying sunscreen before water time and as needed throughout the day (generally every two hours or so). They recommend it be SPF 15 or greater, one that protects against UVA and UVB rays, and is waterproof. Dr. Oleniacz says that in his experience, you sometimes get what you pay for, regarding “bargain” sunscreens – he recommends using recognizable brands. He also recommends SPF clothing, which I personally think is one of the best inventions of all time. I saw a ton of kids at camp wearing SPF shirts. Dr. Oleniacz notes that most tick bites are harmless (though I can attest that they itch like crazy). He recommends after removing the tick, tape it to the family’s calendar, and that way if the child develops a rash or fever, you’ll know exactly when it happened, and you’ll have the tick to take to the pediatrician. Which sounds both gross and oddly Pinterest-worthy to me. I’ll be doing this. Stings from yellow jackets, a type of wasp, are a very common summertime nuisance. A few simple steps that the Schoolhouse staff takes to avoid stings for campers is to make sure everyone wears shoes at all times; eat only one thing at a time while outside (the more food that’s out, the more stingers that are attracted); and does not disturb hives or insect nests. Kids are encouraged to take care when rolling logs, or playing in the woods. They keep a very close eye out for any signs of distress from an allergic reaction to a sting. And they teach the kids to stay calm (sudden movements like waving arms makes these stinging beasts really mad), and not to squash a yellow jacket. That just sends a message to his buddies to come attack. Dr. Oleniacz recommends, for younger children, apply bug spray on their hat and clothing, and less on the skin. He also notes that most stings respond well to home treatment, but excessive swelling around the sting site should be checked by a pediatrician. Obviously, the best way to avoid poison ivy rash is to avoid poison ivy plants. So kids at camp are taught to identify and avoid the evil little plant (I have a personal vendetta against poison ivy). Leaves of three, let them be! If contact happens, they encourage the child to wash the area well with soap and water and change clothing. Dr. Oleniacz told me that one way to differentiate poison ivy from other 3-leafed plants is to look at damaged leaves. Poison ivy oxidizes and turns black at the edge of a broken leaf. That’s my “learned something new” tip for today. Those are the main summertime ailments found at Schoolhouse of Wonder, and likely most camps throughout our state, all summer. You can attempt to avoid them, but the occasional sting or poison ivy rash may occur. Is that a reason to keep those kids inside? Absolutely not.